In an organisation primarily made up of young men, it’s no surprise that The Great War (1914-1918) took such a heavy toll of the band’s members. 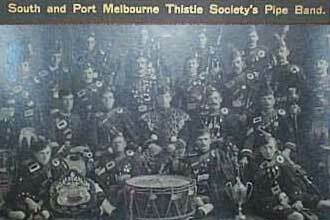 The Age, July 11 1932 reported on the monthly social of the South and Port Melbourne Thistle Society (whose band became Melbourne Highland Pipe Band). Guest of honour was Mr. R. Young, secretary of the Society. In his speech he informed attendees that “of the [band’s] 26 pipers and drummers at the outbreak of the war, 22 enlisted, and of that number seven lost their lives“. As we head into a period of first world war centenaries, it’s sobering to reflect on these awful figures. They perhaps help bring closer to home the impact and tragedy of those terrible times.